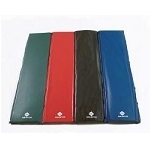 This padding is designed for an outdoor environment. Made with a tough urethane skin, this product will be able weather the elements very well. The unit has a uniform color appearance and a steel insert that provides strength at all mounting locations and stiffness along the backboard. All mounting hardware included in the packaging. Fits most 72 in. Backboards (will fit Goalsetter 72 in. systems). Available in Red, Blue, Green, and Black. 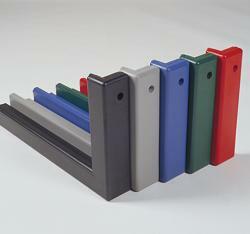 Steel insert extends the length of the padding for added stiffness and support. Mounting Hardware all included in the packaging. Competitive Edge Products, Inc. is an authorized reseller of Goalsetter Basketball Accessories Backboard Edge Padding. A: Unfortunately, we don't have samples. I'm sorry for the bad news. Q: How wide is the channel that actually wraps the backboard? I am looking for padding for a wooden backboard. Will this work? A: Please call 1-800-362-4625 to check the compatibility of these backboard pads. Fast Shipping: Orders for the Goalsetter ER972 generally leave the warehouse within 1-2 business days. Delivery Details: This product generally ships directly from the warehouse in Lynnville, IA. This item generally ships via FedEx and may not require a signature. Dimensions: 72" x 5" x 5"